There are no tarot card reading instructions that are cast in stone. Tarot is a tool to allow individual interpretation; therefore it would be impossible to create "laws" for using these cards. Most often, people who enjoy and utilize tarot cards do not require that all communication they receive be based on an exact science. 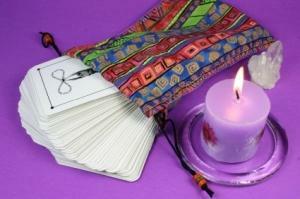 This article will suggest some common ways and rituals for reading tarot cards. Feel free to use the information that appeals to your reading style. There are steps that you can take before you begin reading that will help you open yourself to the messages of your cards. Select a deck of cards that appeals to you. Find one with artwork that speaks to your soul, with the cards being of a size and texture that feel comfortable to hold. Once you find the right deck, study the basic meanings of the cards. When you are not using your cards, place them in a black lined bag or a special wooden tarot box. This will keep out negative energy and also protect your cards from damage and loss. Cleansing tarot cards clears them of energy from past readings or negative influences. This cleansing can be done in several ways. Create your own tarot blessing ritual. Place the cards on a window ledge for 24 hours and allow the sun and moon to renew them. For a quick cleansing, you may place all the cards in numerical order. Taking care of your tarot cards is a practical and spiritual activity that will be beneficial to you as a reader. As you gain experience reading tarot cards, you will most likely add to this list of instructions or discard some of them. How you relate to the cards will dictate which steps you should take during a tarot reading. Prepare the area where you will perform the tarot reading. Clear away distracting clutter, open or close the blinds, set up any additional tools you plan to use such as candles, crystals, etc. Place a cloth covering over the surface that the cards will be placed upon. This protects them from external energy if the table or other surface is used for activities other than readings. Arrive at a calm and focused place in your mind. This may be done by performing a ritual or invocation, a smudging ceremony, a few moments of meditation or simply by lighting a candle. Some readers do not use a beginning ritual at all; this step is up to the individual. Clarify the question being asked, and focus on it. It sometimes helps to write down the question. You may wish to keep a tarot journal, and write down the questions and the results of the reading. Shuffle and cut the deck. You may do this yourself, or allow the querent to do so. This is a matter of personal preference. Some readers do not allow other people to touch their cards, while others prefer it because they feel it allows the querent's energy to assist with the reading. You may wish to shuffle the cards yourself and allow the querent to cut the deck. Cutting the deck is usually done by placing the cards into three piles from left to right, and then picking them up from right to left. Lay out the cards in the tarot spread you have decided best lends itself to the question that has been asked. Once you have finished your reading, bid farewell to the cards and any spirits you invoked before or during the reading, and thank them for their help. These are only basic tarot card reading instructions. How to read each card's meaning, how to interpret reversed cards, and what context to assign to gendered cards are all matters of personal preference that will develop as you gain experience. It is most important to be open to the card's messages and to learn to trust your abilities as a tarot card reader.